Kurt Vonnegut: Critical Insights features outstanding, in-depth scholarship by renowned literary critics, and it is a great starting point for students seeking an introduction to Vonnegut and the critical discussions surrounding his work. Edited by Robert T. Tally Jr., this volume in the Critical Insights series presents a variety of new essays on the popular late-twentieth-century American novelist. 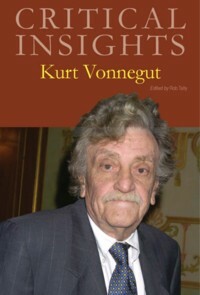 For readers who are studying Vonnegut for the first time, a biographical sketch relates the details of his life and four essays survey the critical reception of his work, explore its cultural and historical contexts, situate Vonnegut among his contemporaries, and review key themes in his work. Readers seeking a deeper understanding of the writer can then move on to other original essays that explore a bevy of topics, such as major thematic trajectories in Vonnegut’s work, the significance of metafiction in Vonnegut’s writing, Vonnegut’s relationship with conventional Christianity, and Vonnegut’s use of generic conventions. Works discussed include Slaughterhouse-Five, Breakfast of Champions, Hocus Pocus, Cat’s Cradle, and The Sirens of Titan. Contributors include such eminent Vonnegut scholars as Charles J. Shields, Donald E. Morse, Peter Freese, Susan Farrell, Paul L. Thomas, and Gilbert McInnis. Rounding out the volume are a chronology of Vonnegut’s life and a list of his principal publications as well as a bibliography for readers seeking to study this fascinating author in greater depth. About this volume, Robert T. Tally Jr.
On Kurt Vonnegut, Robert T. Tally Jr.
Walker Percy: Kurt Vonnegut for Adults?, Henry L. Carrigan, Jr.